Here in the United Kingdom a lot of us play various Lottery and Postcode related games. These can vary from picking numbers in a draw or hoping your postcode is randomly picked from a selection. Over fifteen months ago I came across a website (previously known as Free Postcode Lottery) called Pick My Postcode. I was originally unsure about it, I thought it to perhaps be a scam. But after some research I concluded it was safe for me to join and to use. What happens is that you sign up, your email and name and postcode of your house are stored, and then if during one of their daily draws your postcode is chosen you win a cash prize. During my time of playing the prizes have ranged from £10 to £1000. And I was lucky enough to win the “Stackpot” Draw which gave me a win of £10. Something else that happens while you check the daily draws online on the website, is that you accumulate a personal bonus. So each time you visit the website and click to see what postcode has come up, you get 1p added to your bonus. This obviously adds up over time, also you get entered into more and more draws because of it. But not only that! You also receive your bonus as a bonus if you win on another draw! So when I won mine, I won the £10 plus my bonus, which at the time was another £10! In the image above you can see what my Bonus currently sits at, as well as the various sections of the website available such as Referrals and Rules. In this image above you can see all of the titles of the draws and the tick displayed means I have already visited that one, gotten my bonus and moved on for the day. The amounts on the right hand side are what the chosen postcode holder will win for that draw. I am keeping my fingers crossed that one day I win the Main Draw. So why do I think you should join me and thousands of others who play on Pick My Postcode. Well it’s simple really. It may have taken fifteen months for me to win something, but it’s free money. For clicking the website pages daily which takes under a minute, and watching the odd video or partaking in the odd multiple choice answer survey, I have been accumulating cash that I have now had (and happily spent!). 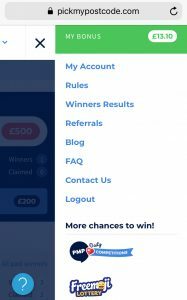 The prize money is generated on a daily basis by the websites adverts revenue, this in turn is created from people visiting the website and checking their postcode. It is a clever concept and the prize money does vary day to day. But the more people who sign up and take part in it, the more they are able to give away. If you would like to know more and see the website for yourself I will leave the link below. You can also find them on Facebook because they have a page on there. If you do decide to join will you please do me the smallest of courtesy? Will you click on My Personal Referral Link HERE because I get extra pennies added to my bonus for spreading the word about this great website. Once signed up you can also do your own Referral and invite your friends and family members in order to increase your bonus. You never know, your postcode may come up! Oh and one last thing, you can check on the website (once you’ve joined) how many times (if any) your postcode has come up in draws. Handy! Thank you for reading this blog post today, and I hope that if you decide to join this website then it will be as worthwhile for you as it has been for me. Though I never give up hope of mine coming up again! Ha! This entry was posted in Lifestyle, Pick My Postcode, Reviews, Winnings by Sabrina. Bookmark the permalink.